Frank Edwards got into radio at pioneering station KDKA, Pittsburgh, in the 1920’s. He came into national attention in the mid-40’s when he had a national news and opinion program on the Mutual Broadcasting System. 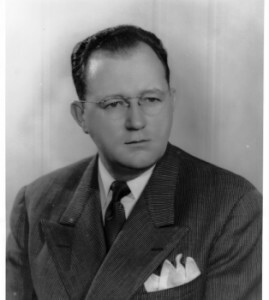 In 1955 Edwards was hired by WTTV, Bloomington, as a news commentator. He had great interest in Unidentified Flying Objects (UPO’s), and wrote a number of books on the subject, including “Stranger than Science” and “Flying Saucers – Serious Business.” Edwards died June 23, 1967.